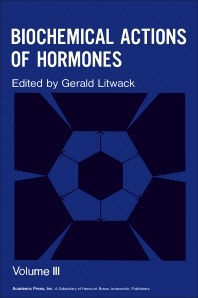 Biochemical Actions of Hormones, Volume III is a collection of papers that deals with steroid hormone action, hypothalamic-regulating hormones, plasma membrane receptors, thyroid hormones, hormones acting on the synthesis of proteins in liver perfusion systems, as well as on approaches using genetics and cell culture. One paper explains why cell hybridization can be a useful technique in studying both genetic control of differentiated functions and of hormonal induction. Another paper discusses the general approaches in the study of ligand-membrane interactions, and cites experiments dealing with polypeptide hormones and catecholamines. It explains in detail the physiochemical interaction between a radioactively labeled ligand and the plasma membrane, either as found in an intact cell or in an isolated membrane preparation. One paper discusses the introduction and time course of estrogen-stimulated biosynthetic events in the uterus. It analyzes the relationship of the estrogen-binding protein to the biological responses of the uterus, including the "domino" versus "sustained output" model of estrogen action. One paper explains, by using a chick oviduct, how to investigate the hypothesis that hormones can activate genes to allow transcription of new species of messenger RNA. This collection can prove beneficial to biochemists, molecular biologists, cellular biologists, micro-biologists, developmental biologists, and scientists involved in cell research.